Eric Hacker did not have a Giants debut to remember. Eric Hacker was shaky in his spot start and the Giants continued to struggle at the plate with runners in scoring position in a 5-3 loss to the Padres Friday to open a nine-game homestand. 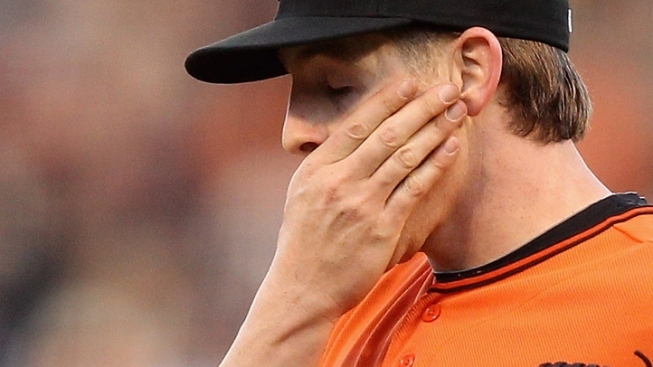 Starting pitching report: Eric Hacker did not have a Giants debut to remember. While his final pitching line was respectable (6 IP, 8 H, 3 ER, 2 BB, 7 K), the 29-year-old spot starter was hit hard and could have given up more runs if not for an outfield assist and a caught stealing. Hacker, who Bruce Bochy said before the game, was capable of throwing up to 110 pitches, ended up with 81 pitches, 56 of which were strikes. The seven strikeouts were impressive for Hacker, who has a 6.4 K/9 ratio in his minor league career, but two of his punch-outs came against Padres pitcher Cory Luebke. Bullpen report: Jeremy Affeldt was the first reliever to get the call from the bullpen and he was not sharp. With one out, former Giant Jesus Guzman hit a fly ball between Angel Pagan and Melky Cabrera. Pagan had a chance to hold Guzman to a single but bobbled the ball. All of the sudden, after back-to-back singled by Chase Headley and Nick Hundley and a wild pitch from Affeldt, the Padres’ lead went from 3-2 to 5-2. Affeldt came back out for the eighth and recorded a 1-2-3 inning with two strikeouts. In the top of the ninth, Guillermo Mota’s leadoff walk was erased on a failed steal attempt and the veteran right-hander struck out the other two batters he faced. At the plate: Angel Pagan, fresh off hitting a three-run game-winning home run in the series finale in Cincinnati, led off the game for the Giants and quickly fell into an 0-2 hole. But Padres starter Cory Luebke couldn’t put him away, leaving a 1-2 fastball out over the plate that Pagan sent deep into the left-field bleachers. It was the first leadoff home run of the season for the Giants and Pagan’s fourth on the year. Buster Posey had an opposite field RBI double in the fifth inning and a solo home run in the eighth and is now batting .371 on the season. Posey and Pagan are tied for the team lead with four home runs each. Read more at CSN Bay Area.